The resulting data reveal gas (characterized by sodium, which absorbs yellow light) streaming away from the galaxy center at speeds of over 1,000 kilometers per second. At this speed, the gas could go from New York to Los Angeles in about 4 seconds. 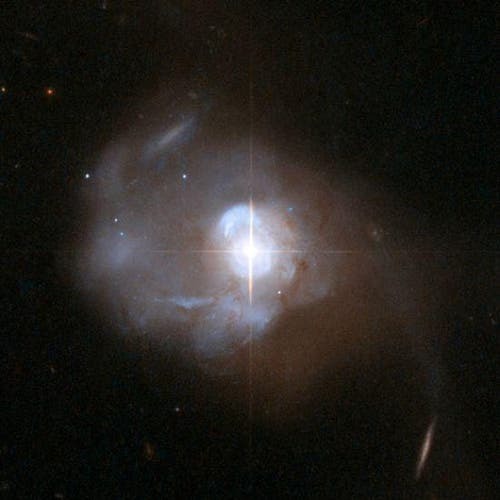 When two galaxies merge to form a giant, in this case Markarian 231, the central supermassive black hole in the new galaxy develops an insatiable, but ultimately unsustainable appetite for cosmic gas and dust. Markarian 231 is located about 600 million light years away in the direction of the constellation of Ursa Major. Although its mass is uncertain, some estimates indicate that Markarian 231 has a mass in stars about three times that of our Milky Way galaxy and its central black hole is estimated to have a mass of at least ten million solar masses or also about three times that of the supermassive black hole in the Milky Way. New observations with the Gemini Observatory reveal an extreme, large-scale galactic outflow that brings the consumtion to a halt. The outflow is effectively blowing the galaxy apart in a negative feedback loop, depriving the galaxy's monstrous black hole of the gas and dust it needs to sustain its frenetic growth. It also limits the material available for the galaxy to make new generations of stars. According to Sylvain Veilleux and David Rupke of Rhodes College in Tennessee, Markarian 231, the galaxy observed with Gemini, "is the closest and best example that we know of a big galaxy in the final stages of a violent merger and in the process of shedding its cocoon and revealing a very energetic central quasar. This is really a last gasp of this galaxy; the black hole is belching its next meals into oblivion!" "When we look deep into space and back in time, quasars like this one are seen in large numbers and all of them may have gone through shedding events like the one we are witnessing in Mrk 231." Although Mrk 231 is extremely well studied, and known for its collimated jets, the Gemini observations exposed a broad outflow extending in all directions for at least 8,000 light years around the galaxy's core. This outflow is removing gas from the nucleus at a prodigious rate – more than 2.5 times the star formation rate. The speeds observed eliminate stars as the possible "engine" fueling the outflow. This leaves the black hole itself as the most likely culprit, and it can easily account for the tremendous energy required. The energy involved is sufficient to sweep away matter from the galaxy. However, "when we say the galaxy is being blown apart, we are only referring to the gas and dust in the galaxy," notes Rupke. "The galaxy is mostly stars at this stage in its life, and the outflow has no effect on them. The crucial thing is that the fireworks of new star formation and black hole feeding are coming to an end, most likely as a result of this outflow." The environment around such a black hole is commonly known as an active galactic nucleus (AGN), and the extreme influx of material into these black holes is the power source for quasi-stellar objects or quasars. Merging galaxies help to feed the central black hole and also shroud it in gas. Mrk 231 is in transition, now clearing its surroundings. Eventually, running out of fuel, the AGN will become extinct. Without gas to form new stars, the host galaxy also starves to death, turning into a collection of old aging stars with few young stars to regenerate the stellar population. Ultimately, these old stars will make the galaxy appear redder giving these galaxies the moniker "red and dead." Numerical astrophysicist Philip Hopkins, a Miller Fellow at the University of California at Berkeley, explains that many physical processes unique to rapidly growing black holes are likely to play a role in propelling the winds observed by Gemini. "At its peak, the quasar shines with such intensity that the light itself is 'trapped' by a cocoon of gas and dust pushing on material with a force that can easily overcome the gravitational pull of the black hole." Hopkins adds that the bath of X-rays and gamma rays known to be generated by quasars could also heat up the gas in the galaxy's center until it reaches a temperature where it "boils over" and causes a bomb-like explosion. "But until now, we haven't been able to catch a system 'in the act.'" Part of the problem, according to Hopkins, has been that the most visible outflows are those 'collimated jets' already known in Mrk 231. These jets are trapped (probably by magnetic fields) in an extremely narrow beam, whereas material is falling into the black hole from all directions. The previously known jets therefore only cause very localized damage – drilling a tiny hole in the cocoon, rather than sweeping it away more broadly as seen in these new, more all-encompassing, outflows. The observations for this study were obtained with the Gemini Multi-Object Spectrograph (GMOS) on Gemini North, on Mauna Kea, Hawai'i. The study used a powerful technique known as integral field spectroscopy. The integral field unit (IFU) in GMOS obtains a spectrum at several hundred points around the galaxy's core. Each spectrum is then, in turn, used to determine the velocity of the gas at that point and represents the third dimension in what is called a data cube. The growth of supermassive black holes, which are found in the centers of all normal galaxies (including our Milky Way), is fundamentally linked to the stars in galaxies. Black holes grow and stars form over time, resulting in a tight connection between the mass of the central black hole and the mass in stars of the host galaxy. Since most galaxies in the local universe do not currently have actively growing black holes at their centers, some process must eventually emerge to shut down this growth and development. Theoretical modeling specifically points to quasar outflows as the culprit. In this negative feedback loop, while the black hole is actively acquiring mass as a quasar, the outflows carry away energy and material, suppressing further growth. Small-scale outflows had been observed before, but none sufficiently powerful to account for this predicted and fundamental aspect of galaxy evolution. The Gemini observations provide the first clear evidence for outflows powerful enough to support the process necessary to starve the galactic black hole and quench star formation.